A gilded saxophone hangs from a chain and rests on his chest. 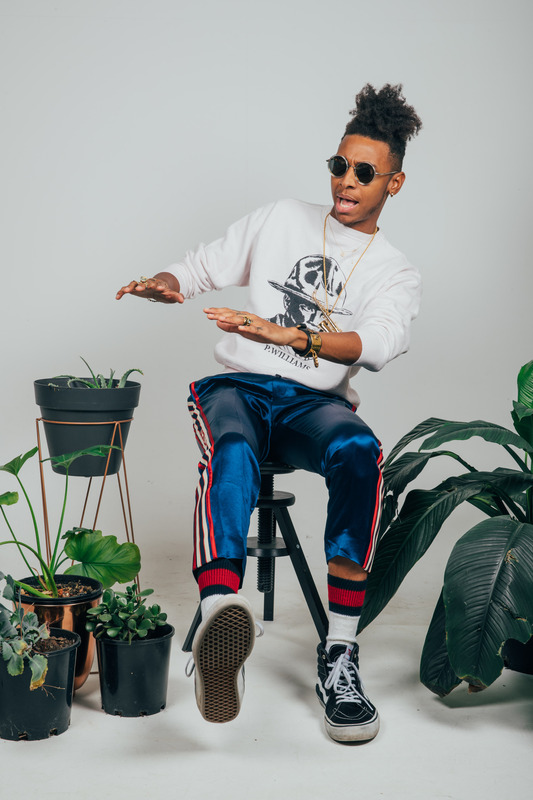 Fresh off a highly anticipated performance at the Cape Town International Jazz Festival – and before treating Joburgers to a private show – Masego is basking in his shine. But unlike his bling (do people still use that word? ), the Virginia-raised artist who was born Micah Davis refuses to rest. When I sit down with the artist who took on the Setswana name, Masego, as his alias, he tells me he’s got a studio session with AKA planned for that evening. As told through Twitter, the pending Supa Mega collab came about after Masego shazamed all the songs he liked in Cape Town clubs and they turned out to be AKA songs. That night, he also takes to the Universal Music Group stage to perform a new song where he croons about how he’s going to “call you lady, lady”. Then, he performs a slew of songs ranging from Wifeable as well as Girls That Dance (with Medasin) to Tadow (with FKJ) and his latest, Queen Tings. On that last song, he name-drops Kenya’s Lupita Nyongo, Zimbabwe’s Danai Gurira and a list of American actresses. I call him out on the fact that his South African dedication doesn’t even include Nomzamo Mbatha or Thuso Mbedu. “People ask me about that,” he admits. “But it’s about the essence. Think about it like this: what started Tadow was just being there. It’s not about a Parisian woman. I just saw her and she hit me like: ‘Tadow!’ So with Queen Tings, what started the inspiration for the song was my first trip to South Africa,” he continues. I can confirm that women in this country love Masego. At his Jozi performance, he goes from a cheesy cover of Snoop Dogg’s Sensual Seduction into Fergie’s Glamorous and he’s almost drowned out by these high pitched screams from the audience. Before he performs Navajo, he asks everyone to make hearts with their hands and put them in the air. The women laugh and cheer him on. See? Ladies love cool Masego and in a sense, he carries that with him. His left knuckles spell out JAZZ while on his right hand, a microphone on his index finger knuckle takes the shape of an L. On the middle finger, a snare drum creates an O, and next to that, a saxophone is angled to look like a V while the keys on the pinky knuckle form an E.
“I knew I wanted to get hand tattoos since I was in high school,” he tells me, “and I also knew it represented the fact that I would never get a job again. I had to be ready for that lifestyle. I wanted ‘jazz’ on my hand and I wanted it in Old English (font) just because of the way the game was around me but I wasn’t in it. Then I wanted to balance out this grungier side of me with a more lighthearted side which spells out love. These are all the first instruments I learned how to play,” he says, touching the LOVE. Masego is a stellar saxophonist and he is determined to be a multi-genre artist. Armed with an MPC and other gadgets, he also creates beats live on stage. Through his first EP, Traphousejazz, Masego came off more as a producer than a performer. He tells me this was because he was scared and somewhat scarred. Now Masego takes that sense of self everywhere. It’s easy to see that he truly enjoys being who he is when he’s on stage and that is the most contagious thing when he is in a room. No wonder he is not interested in resting.